Winemaking is not always about making wine. There are always less glamorous tasks to be done, like packaging, which we are working on now. 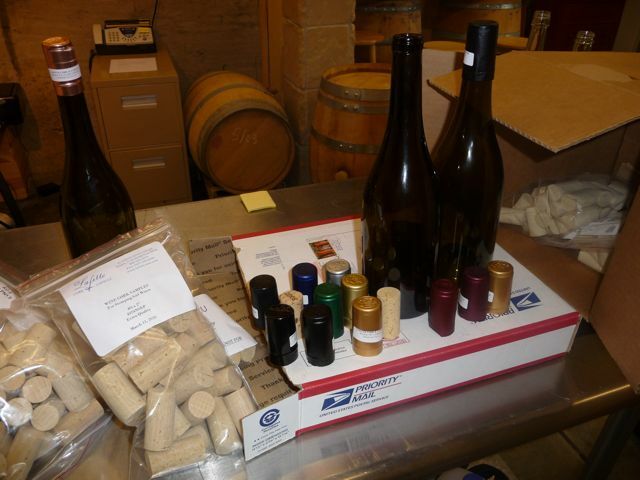 Later this summer we will bottle our 2009 vintage and we are lining up packaging details now. This means decisions have to be made on what size, color and nationality the bottle will be. We must choose what type of cork to use and if our logo will be branded on it. Then there is the capsule–what material, color, size do we want? Logo or no logo? And last, but not least, we must update our label for the 3 different vineyards 2009. Under my radar, downstairs, Uzi has been busy mixing and matching different colored capsules with various styles of bottles with our 2008 label slapped on to get a visual of what we want to end up with. During his mix and match process, Uzi put a filled bottle with our 2008 Stomping Girl label, a red capsule and a Stomping Girl branded cork in it on our kitchen counter for me to see. In an ironic twist of fate, later that same day a sommelier/wine director from a very well-known restaurant coincidentally paid me a surprise visit on an unrelated matter (we were working together on a project for our kids’ school.) He knows we make wine and spontaneously asked if he could try it. I obliged, of course, after all there was the bottle of it right there in front of us on the counter. Had I followed rule #1 of pouring your wine to trade, I would have tasted it, and I would have known that it was not the 2008 Stomping Girl Lone Oak Vineyard, Santa Lucia Highlands that was clearly indicated on the label and that I portrayed it to be. The gentleman gave it a sniff and a whirl. His feedback was brief as he was in a hurry. He observed cranberries on the nose and the palette and then had to run to an appointment. Cranberries??? I should have known something was up at that point. Our Lone Oak definitely does not invoke cranberries. It has a much darker red fruit component. That night I discovered the wine that had been on the counter, that I had poured for our new friend was not what I thought it was. Aack! I had been waiting weeks for the perfect opportunity to pour our wine for this man and I blew it! How was I to know that a bottle labeled 2008 Stomping Girl Lone Oak Pinot Noir was in fact a bottle of our 2007 basement Pinot? Still a perfectly drinkable Pinot but not our Stomping Girl that retails for $38. Luckily, we had a nice chuckle over it later and I promised to pour the real Stomping Girl for him next time. Wonder if he’ll believe me? Hi Kath and Uzi, I just showed Carolyn Chappell Light your web site and blog. There is a lot on it I hadn’t seen. I guess I haven’t looked at it recently. Carolyn enjoyed reading it all! I enjoyed it also! If one orders your Pinot Noir, how soon after ordering does it get shipped out. I think you are out of your 2008, but they are here in Colorado until the end of July. She may be interested in ordering some if it is still available…..
Use Dad’s e-mail if you respond. He has his I-Phone and also his computer. I don’t check my e-mails!